The HbbTV Application Toolkit – HAT – presents a CMS for creation of HbbTV applications, which allows content creators without specific technical skills to build interactive TV applications and is developed by Fraunhofer FOKUS' Competence Center Future Applications and Media (FAME). So far HAT covers a simple themes collection which can be accessed through the editor UI. Here the content editor can choose from different layouts and designs regarding the background and color scheme. The layouts include basic modules, broadcast or IP-video, text, image and live blog. The live blog includes an external live blog coming via social media APIs. We see a great potential in the uptake of programme-related HbbTV apps creating new markets for developers and technology providers. HAT provides an editor/CMS with a set of GUI templates that can be filled with text, images audio and video content via a responsive user interface for desktop and mobile devices alike. The content palette can be extended by customized modules, e.g. for display of social-media feeds. The toolkit includes a collection of templates and modules, allowing control of all application elements including broadcast source, IP video source, images, text, picture gallery, social media feeds, popups and overall application layout. When creating more than one page, a navigation menu is automatically generated. Linked data for service quality and experience gain in DVB-T/T2 networks. Digital service broadcast suffers from misconfigurations at the source and dynamically changing signal propagation conditions. The lack of feedback leads to undisclosed service degradation and decreased experience. Selective professional monitoring is costly and often not enough to cover large areas. Integrates with existing monitoring systems and offers a comprehensive API (SNMP, MQTT, REST/HTTPS). 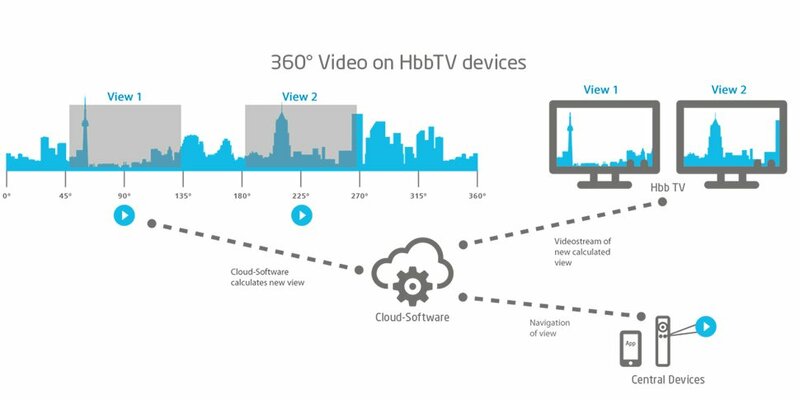 The Fraunhofer FOKUS 360° Video Playout makes it possible to watch 360° Video content on HbbTV. Users can navigate the video by remote control or a mobile device which is connected to the TV over the Fraunhofer FOKUS Multiscreen Application Framework, a HbbTV 2.0 conform companion screen implementation. The Fraunhofer FOKUS Ad-Insertion Tools demonstrate standards-based dynamic ad-insertion techniques for HbbTV 2.0 and Over-the-Top delivery (OTT) via MPEG DASH and HTML5. VAST and various ad types like display and video ads.